Outwardly, I’ve had a great start to 2012. Last month, I taught another fun soldering class and have an art journaling class coming up. 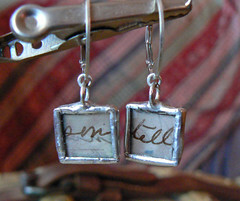 I’ve been reading awesome books and soldering adorable earrings. The charms are all packaged and ready to mail for the Artfest charm swap. I have a list of projects and events that are keeping me happily busy. Inwardly, I’ve been battling that feeling of stuckness. I feel like I’m just passing the time, almost like I am preparing for a birthing. I am biding time until the emergence of this new thing. In the swirly parts of my mind, a story is forming. 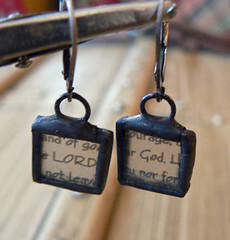 Awesome earrings! You are so clever!